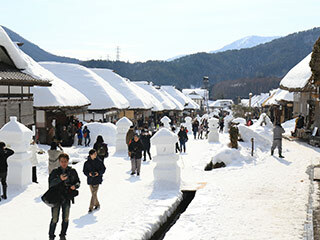 Ouchijuku Snow Festival (大内宿雪まつり) is one of the unique and interesting snow festivals happens in Shimogo, Fukushima Prefecture. It is held at the weekend of the middle of February. Ouchijuku is one of the best traditional towns with many classic houses. During the festival, those classic houses will be covered with a beautiful snow. In the festival, there are many events and performance you can enjoy and many food stands, restaurants, and gift shops will be open. At night, the snow lantern towers will be lit by candles and there are fireworks. The flash lights of the fireworks lit the traditional houses with snow beautifully. Many shops close around 5 p.m.
Mostly, the 2nd weekend of Feb.
1. use Aizu Line to Yunogami Onsen Station. 2. use the local bus to Ouchi Juku. Ouchi-Juku is a great Edo Style town located in Shimogo, Fukushima Prefecture. It was built in 1640. This post town was used to be a post town of Nikko Road. During the Edo period, it was used for Daimyo Parade. Also, many travelers used this road. Today, there are still 50 traditional houses that are about 300 years old in this town. The road is about 450m long. Many of houses are still in use as a house and open as shops and restaurants. About 1 million visitors visit here every year. In winter, this road will be completely covered with snow.